I love to travel and I believe that travel should evoke memories for a lifetime. When I organize travel for my clients, I make sure that each travel experience is spot on, memorable, and cost-effective. That is the core and spirit of all my offers to my clients. Nothing is as exciting as meeting my clients after their trip and they can't stop talking and sharing their experiences with passion and excitement. That is fulfilling and it makes me look forward to the next clients. Meeting and making friends with different people from all over the world is great and I treasure each one of my clients who has made me look forward to my everyday planning and creating memories for people who love travel as I do. "I specialize in off the beaten track, hidden places that attract clients seeking adventure as well as personalized experiences away from the crowds. 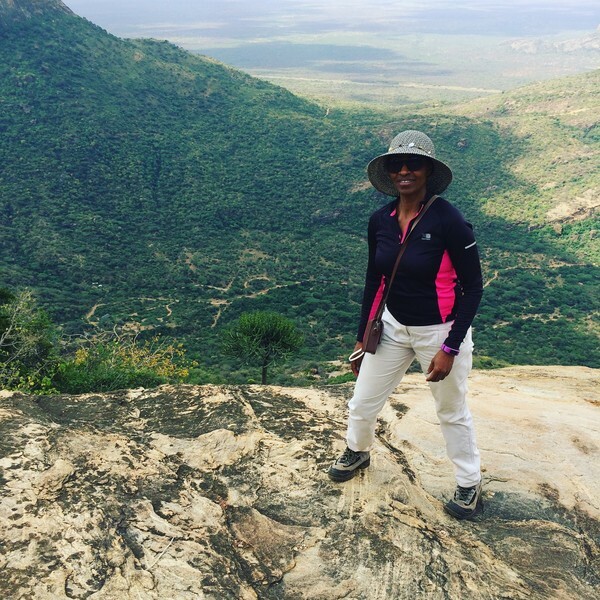 Kenya as a destination is full of beautiful hidden travel gems that are not in every travel guide and these are the places and experiences that I want to share with my clients. I love the outdoors, and trekking the many mountains and hills all over our beautiful country. Wildlife viewing is key to any itinerary when visiting Kenya. We make sure that even those who are trekking our mountains get to experience some wildlife viewing in their travels, after all, this is a Safari Country." "Purely by accident. I am a trained Anthropologist and got into travel through a relative who was running a tour company and who invited me to join her sales team from a public service job[ Children's Officer]. I agreed to join her team 25 years ago and fell in love with travel. After working for 8 years in the travel industry I started my company to continue with my love for travel but this time on my own. I truly enjoy helping my clients create memories our beautiful country. There is nothing else I would rather do. Given the opportunity, I would spend my time traveling and experiencing new cultures and places." "In 1999, we went camping at Amboseli National Park in Kenya. At that time, there was only 1 public campsite. We set camp and left our food and drinks in the vehicle as we went to sleep. In the middle of the night, a naughty elephant decided to break into the vehicle and share our food. We were woken up by the noise of broken glasses but upon looking out and realizing that elephants had taken command of our food, we played it safe and stayed in our tents. Needless to say, we had no breakfast, lunch or dinner for the next 2 days and had to make do by eating in the expensive park lodges. It is unlikely that I will ever forget this experience. For your information, the current campsite in Amboseli has a fence to keep off unwelcome night guests. As a rule, never leave a "Tusker beer " where an elephant can smell it ...they will help themselves." Fall in love with the wild landscapes of Uganda and the animals that live in them on this 6-day adventure. Keep an eye out for lions, elephants, and more as you explore two national parks and enjoy safaris on both land and water. You'll also spend a day tracking a family of mountain gorillas through the forest for an unforgettable experience.